Blondini Enterprises - 105 min. Crew: Screenplay: Matt Murphy; Director of Photography: Crighton Bone; Editor: Jonno Woodford-Robinson; Production Designer: Seth Kelly; Costume Designer: Kristin Seth; Hair & Makeup Designer: Jacqui Leung; Composer: Jonathan Crayford; Producer: Tom Hern; Director: Matt Murphy. 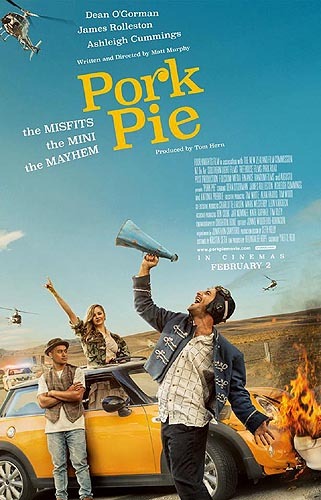 Pork Pie tracks the escapades of a trio of accidental outlaws as they travel the length of New Zealand in a yellow MINI Cooper S, protesting conformity and chasing lost love with a posse of cops and a frenzied media in hot pursuit. This is a updated version of the 1980 hit, 'Goodbye Pork Pie', which was directed by Matt Murphy's father, Geoff Murphy. Although there are pluses and minuses concerning both this and the original, I think I still prefer the original. The photography of 'Pork Pie' is better than the original and I did get a couple of laughs from the last 30 minutes, but the script and acting is weak. Sequels and redos seldom match the originals and this is no exception. Starting 24 May 2017, a PAL R4 DVD can be purchased from New Zealand sources for $30-40. It is presented in a 2.38:1 format, 16x9 enhanced, with a DD Surround 5.1 English language track. On the same date, there is a Region B Blu-ray release, selling for $35-45, with DTS-HD-MA 5.1 English language track. There are optional English subtitles. Extras (all at 1080p): 'Meet the Pork Pie Mini' (1:57), 'Invercargill - Home of the Blondini Gang' (2:04), 'In Conversation with director Matt Murphy' by Liam Maguren (11:21), 'Pork Pie eating Competition in Maketu' (2:23). Starting 16 August 2017, the DVD and Blu-ray will be available from Australia sources. As of 02 June 2017, no confirmed releases in other markets. No known soundtrack cd of this title as of 30 March 2017.
to imagine a song that might be played at the local folk club. Bodhrán, Cymbals, Water Bowl Miguel Fuentes - Percussion Miranda Adams - Violin. which tend to relate to Luke (James Rolleston's character)."